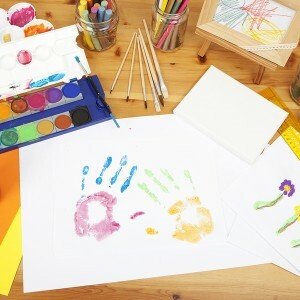 As parents and teachers, we love to incorporate fun, engaging, and even messy activities into learning. We know exactly how valuable a great craft project can be! Please visit the Practickle Pinterest craft board to see a collection of hundreds of high-quality crafts, games and activities to try at home, all hand-picked by us for their value in making reading FUN. For pre-readers, beginning readers and emerging readers aged three to seven, combine these craft ideas with the Practickle experience. As Practickle’s three readings work to increase your young reader’s comprehension and reasoning, these reading activities can become a fun way to revisit and celebrate all the things you’ve learned. With a blank journal, your young reader can become a storyteller! Help them create new illustrations for the books they are reading, or write new stories of their own. The Practickle method highlights the importance of illustrations and pictures. For this game, get out the paint box or use the Curious George mix and paint online. Have fun making new colors. Give each color a name, and talk about them! A graphic organizer is a visual aid that shows the organization of ideas and the relationship between ideas. Using graphic organizers is a Reading Comprehension Best Practice, and will help your young reader’s brain focus on key pieces of information. You can see examples of graphic organizers on the Practickle Pinterest page.